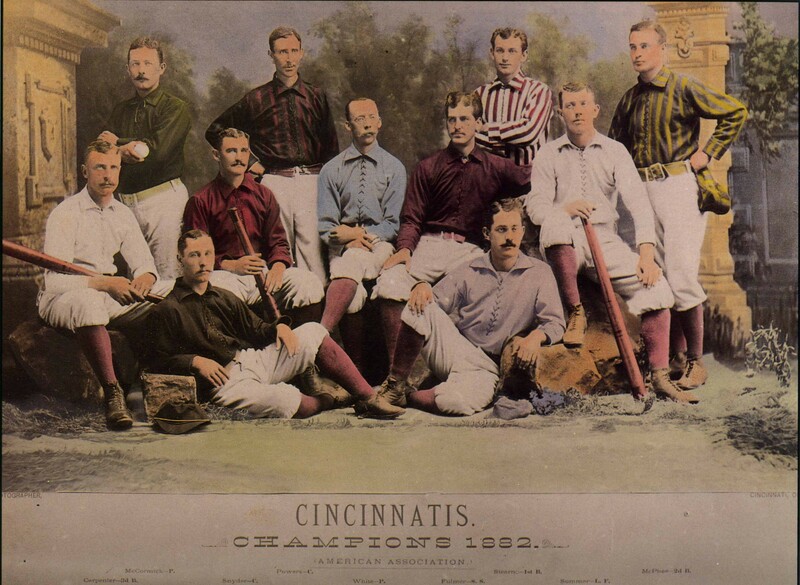 Colorized photo of the 1882 Cincinnati Reds. Pitcher Will White is seated in a blue shirt. First, some interesting facts about the 1882 season that you may not be aware of. This was the first season of the American Association, which included 4 teams that would later move back to the National League where they still exist today – Cincinnati, Philadelphia, Pittsburgh and St. Louis. You may think of the World Series, first played in 1903, as the start of championship series between leagues. Chicago (N) and Cincinnati met in a post-season series, with the two squads splitting a two-game series. There’s a great read about this over at SABR for those who are interested. Dan Brouthers (.373) and Pete Browning (.378) each vied for a .400 season, ultimately falling a touch short. Pat Venditte eat your heart out! Tony Mullane, Louisville pitcher, pitched both right- and left-handed on July 18th. With excellent-fielding pitcher Will White on the mound, Cincinnati turned three triple plays during the season. As for this edition of Card Preview, I’m going to do things a bit differently. Rather than just round up the best players in various categories, I jotted down some thoughts on each team as I rolled games with them in a tournament-style pre-play while on a work trip a couple of weeks ago. Boston: 2B Jack Burdock, LF Joe Hornung and RF Ed Rowen represent half of all 5-rated fielders among regulars, the former being the only infielder with such a rating. Pitcher Jim Whitney is a two-way threat: 25 on-base chances and 8 Deep Drives at the plate; 1 Deep Drive and 6 strikeout readings on the mound. The other pitcher, Bobby Mathews, allows just 11 on-base chances and has a set-best 8 strikeout readings. Buffalo: Dan Brouthers is tied for an NL-best 27 on-base chances. The superstar hit .368 with a .403 OBP and had 6 HR and 63 RBI. To cap it off, he’s a 1B-4. An unreal card for the era. Chicago: Offense that managed a league-best 7.2 runs per game shows up in form of 5 regulars who batted .282 or better, including Cap Anson’s .362 and .397 OBP. King Kelly is a SS-1 but also has 9 Deep Drives – only one other player achieved that. Anson is a 1B-1 but his 27 on-base chances are tied for NL-best. What I’m saying is, you’ll live with those 1s in the field. Starting pitcher Larry Corcoran’s 9 on-base chances against are the best in the NL and his 7 strikeout readings are among the league best as well. Cleveland: Pitcher Jim McCormick (36-30, 2.37, 200 SO) is a Rest 0, so you can thrown him every day and help him battle “Old Hoss” for the league strikeout title. Detroit: LF George Wood hit 7 HR, giving him a DD on 00-04 and a HR on 00-20. Playing in Recreation Park, where a HR falls on 80% of all Park Effect checks gives him a boost at home. He’s also got a pair of team-mates with 5 HR each. #2 pitcher George Derby struck out 182 men in 362 innings of work, giving him 7 strikeout readings. Providence: It’s all about pitcher “Old Hoss” Radbourn, who is among the league’s best with 11 on-base chances against and 6 strikeout readings. 3 regular position players are F runners. 1B Joe Start (.329) and CF Paul Hines (.309) provide the offense for the 2nd place finisher in the NL. Troy: Roger Connor ties for set best with 9 Deep Drives. This is strange, but I love playing with this team just because of the green headers; the cards look beautiful! Worcester: League-worst offense done in by 3 regulars who are VS and 2 others who are S runners. Pitcher Fred Corey allows a set-worst 7 Deep Drives while teammate Lee Richmond allows 5 and also 19 on-base chances, worst in the set. While we’re at it, a 3rd pitcher – Frank Mountain – allows 18 on-base chances. Baltimore: With just 3 regular position players batting above .214, you’ll have little trouble wondering how they went just 19-54 in 1882, finishing last in the AA. They finished at the bottom of the league in both offense and defense, with Doc Landis (12-29, 3.36), Bill Geiss (4-9, 4.80) and Tricky Nichols (1-12, 5.02) not helped out by plenty of 1 and 2 fielding ratings, plus a catcher with a D Passed Ball rating that really hurts when using On-Base Effects, practically a requirement in a 19th century season. Cincinnati: Pennant winners who won league crown by 11.5 games, finishing tops in both offense and defense. Jimmy Macullar is a CF-5. Position players will make the most of balls in play, with 3 regulars who are F or VF runners. Pitcher Will White allows just 1 Deep Drive and has 11 on-base chances – both among the best in the AA. Hick Carpenter (3B) hit .342 and has a whopping 15 SI+ readings. Louisville: Pete Browning (2B/SS) has a set-best 29 on-base chances to help replicate a monster .378 AVG and .430 OBP. DD on 00-04, singles on 05-22 and a walk on 23-28 – ouch! Pitcher Tony Mullane (30-24, 1.88) gets a 0 Rest rating, but you may want to throw some starts towards Guy Hecker (6-6, 1.30, 0.77 WHIP) if you want to get this team into contention for the pennant. Philadelphia: Middling team led by catcher Jack O’Brien, who is a 4 with a B Passed Ball rating, batting .303 with 3 HR. Pittsburgh: Pitchers Denny Driscoll (rare 8) and Harry Salisbury (1 DD) are an adept 1-2 punch at keeping opponents playing station-to-station. Driscoll’s 8 on-base chances against are best in the set. Salisbury’s 6 strikeout readings are also among league’s best. St. Louis: CF Oscar Walker hit 7 HR, good enough for a DD on 00-05 paired up with a HR on 00-22. Hey Chris, this is tremendous! I love your card/season reviews and this newer or different approach is as cool as ever! I will be getting this set as well and it’s very strange(neat) to see a team from Troy in the League! Anyway I also wanted to take a minute to apologize to you. I still haven’t printed out the 2017 0r 1926 season cards yet. My wife is going to print them out for me @ Staples( because I am a total blockhead and have no clue how to even approach this) as she and I e-mailed her the files to her work computer a few weeks ago, as you know. However during the last month + her dad has been slowly dying and passed this morning @ 3:45, it is a blessing for him and her and 7 siblings as he really hasn’t been alive or even responsive for that whole time. I know you didn’t need to hear any of this, but I just wanted to let you know that I haven’t abandoned you or your tremendous DEEP DRIVE and I will hopefully be getting into it fairly soon. I am really and truly looking forward to it! I hope all is going well with you and yours (and your game of course) and think that you should post over at the Tabletop Games Forum!!! Sorry to hear that, Chris. My condolences. Thanks as always for all your support with this project.